The award will go towards the development of the new National Centre for Horticultural Science and Learning, a centre of excellence promoting innovation and world-leading research to support the science, art and practice of horticulture. This major investment will fund infrastructure and enabling works beginning in early 2019, and upon opening in 2020 the public will be able to visit the Centre, view exhibitions and see RHS scientists at work for the first time in the Society’s 214 year history. 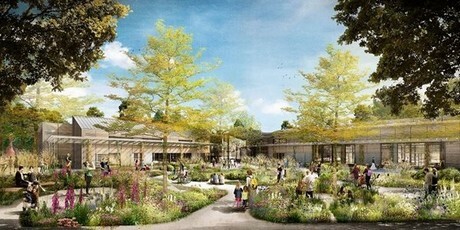 The new Centre will be home to around 70 scientists, advisors and PhD students, and will enable the RHS to continue and augment its ground-breaking scientific research into issues affecting gardeners everywhere, such as climate change and the pests and diseases that threaten our environment. It will also provide state-of-the-art facilities for the preservation and storage of internationally important RHS collections recording more than 500 years of gardening heritage and science. Alongside the Centre, three new gardens by gold medal-winning RHS Chelsea Flower Show designers will be created as ‘living laboratories’ focusing on three key 21st century concerns: health and wellbeing, food production and wildlife. These gardens will also be used to teach both adults and schoolchildren about the vital role horticulture plays in our everyday lives, and promote a better understanding of the benefits of plants, gardens and gardening to people and the environment. The new Centre is part of a wider programme of investment at RHS Garden Wisley that significantly builds upon the existing world-class visitor experience and creates a global knowledge hub for horticultural innovation, science and learning. Its impact will be felt locally, regionally and nationally through the creation of jobs, increased opportunities for learning, training and skills development, and a substantial boost to the visitor economy in the local area. The grant will enable the RHS to continue RHS Garden Wisley’s legacy of innovation, protect its heritage collections and provide access to world-leading horticultural education for people across the UK and beyond for many years to come. This strategic investment in the future of horticulture will help safeguard an industry that supports more than 560,000 jobs and is worth more than £24 billion to the UK economy. RHS Director General, Sue Biggs, says: “Ever since Wisley was first given to the RHS in 1903, the garden has fulfilled twin purposes in pioneering horticultural science and education and offering an inspiring and beautiful visitor destination. “Research undertaken by RHS scientists makes a tangible difference to everyone’s lives, whether that’s through discovering how best to support vital pollinators or identifying the best plants to fight pollution. By applying these findings in the garden at Wisley and sharing them with our wider audience, this knowledge benefits millions of people in the UK and beyond. Dave Axam, Chairman of Enterprise M3 LEP says: “We are delighted to be able to invest in this national research centre, as part of our ambition to support the region’s knowledge- and innovation-based economy, securing and protecting local jobs and delivering on our promise to address the skills gap in the area.